Good morning and welcome to the Ardennes. We’re not actually in the Ardennes but don’t let that get in the way of a good narrative. It’s Amstel Gold Race day and, while we may be in Holland rather than Belgium, this is considered to be the first instalment in the ‘Ardennes Classics’ triptych, followed by La Flèche Wallonne and Liège-Bastogne-Liège next week. There are no fewer than 35 climbs on the menu today as the 263km race twists and turns in labyrinthine fashion through the hills of Limburg in the south of Holland. The race will get underway at 10:30am local time (that’s CET) and will finish nearly seven hours later. We’ll cover it all right here, including the post-race reaction. The women's race is also today, finishing a few hours before the men. We'll also keep you posted on the key developments in that race right here. The teams have all arrived and the riders are getting ready and going through sign-on duties. It’s a lovely bright morning in Maastricht. 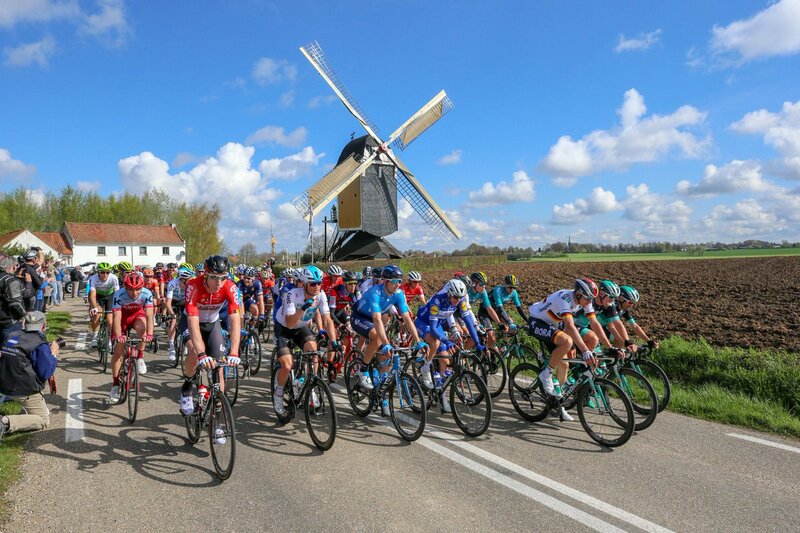 It’s probably now or never as far as our Amstel Gold Race preview goes… Alasdair Fotheringham has all the details, from the route to the contenders, right here. For more on the contenders, CN editor Daniel Benson has picked out 10 to watch across the Ardennes, and thrown in another for good measure. Last year’s Amstel was actually pretty good, wasn’t it? Much derided as a waiting game ahead of a mass charge up the Cauberg, the organisers removed the emblematic climb from the finale last year and were rewarded with a much more open, exciting race, where the hostilities were kicked off from range. They’re hoping for more of the same this year, keeping the Cauberg at bay and even making a couple of extra changes intended to ensure a less controlled affair. 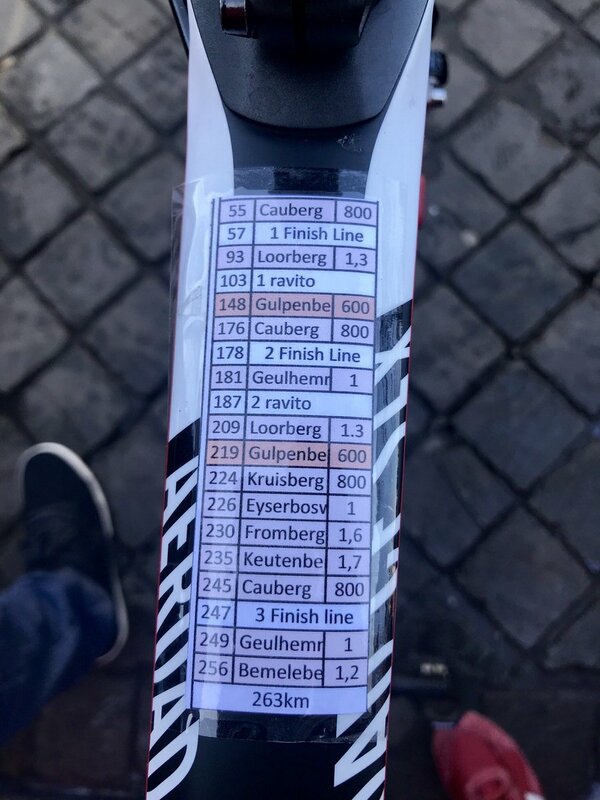 The two final climbs (the Geulhemmerberg with 13.7km to go and the Bemelerberg with 6.9 kilometres to go) are the same, but the routes off them have changed, with narrower roads and technical descents that increase the difficulty of mounting an organised chase from behind. The riders are lined up and ready to start the race. After rolling out, they'll take on a short neutralised section before the race proper gets underway. A minute's silence was observed on the start line in memory of Michael Goolaerts, who tragically died shortly after Paris-Roubaix last Sunday. I want to applaud again @Amstelgoldrace for the route change. The flag has dropped and the race is underway. We'll soon see who'll make it into the breakaway of the day. We have three riders clear. Casper Pedersen (Aqua Blue) and Oscar Riesebeek (Roompot) get away first and they're joined by a second Aqua Blue man, Aaron Gate. They have a very small advantage. That trio is taken back in on the Slingerberg, the first of our 35 climbs. The gradients actually cause a big split in the peloton, sparking momentary panic, but the groups have come back together. "Don’t tell a local Amstel Gold race is in Holland or they throw you out," @wout_davidse writes in on Twitter. "It’s in Limburg." It's a geopolitical minefield out there. A larger break has now gone and it looks like this could stick. Nine riders are in this break and the peloton has definitely let them go. This is our break of the day. Preben Van Hecke (Sport Vlaanderen-Baloise). As the peloton lets its foot off the gas, the nine leaders carve out an advantage of seven minutes. Not sure if you've heard, but we have some exciting developments in the works, in the form of the birth of Cyclingnews Films. Our first venture into long-form film kicks off with 'The Holy Week', a documentary all about the 2018 cobbled classics. To watch the latest teaser and find out more, head to the following link. The gap goes out to 12 minutes. Alejandro Valverde could make history today. The Spaniard has dominated the Ardennes in recent years, winning Flèche and Liège on multiple occasions, but curiously he's never won Amstel. Can he complete the set today? He asked that repeatedly this morning in front of the television cameras, and each and every reply ran along the lines of "we'll see". They've just gone past that windmill. You know the one. 15 minutes 30 seconds now for the nine leaders. The peloton can't allow it to get much bigger than that. Over in the women's race Anna van der Breggen has crashed but seems to be ok and is back in the bunch. The Dutchwoman won all three Ardennes Classics last year and, after winning the Tour of Flanders a fortnight ago, is once again a hot favourite today. 85km to go there. Obviously Van der Breggen features in our '10 to watch' for the Women's Ardennes. Here's Kirsten Frattini with an in-depth look at who'll be challenging for the titles over the next seven days. Peter Sagan's Bora-Hansgrohe teammates are leading the peloton, where they've woken from their slumber. They've just done the Cauberg and the Geulhemmerberg for the first time. As well as Valverde we have Sagan, Kwiatkowski, Gilbert, Terpstra, Alaphilippe, Van Avermaet, Wellens, Benoot, Matthews, Teuns, Nibali, Colbrelli, Haas, Ulissi..... The list is long. Sagan is the bookmakers' favourite - he won Paris-Roubaix last week and certainly has the ability to absorb all these climbs here. The question is whether the likes of Sagan, Van Avermaet, Gilbert, and Terpstra, who all rode long cobbled classics campaigns, can hang onto their form, and whether those who've focused chiefly on the Ardennes - your Valverdes and Kwiatkowskis - can make their freshness count. Still all together in the women's race with 65km to go. Movistar have taken command at the head of the men's peloton. the gap to the break has come down, but not by much. 14:50 the latest time-check after 80km of racing. 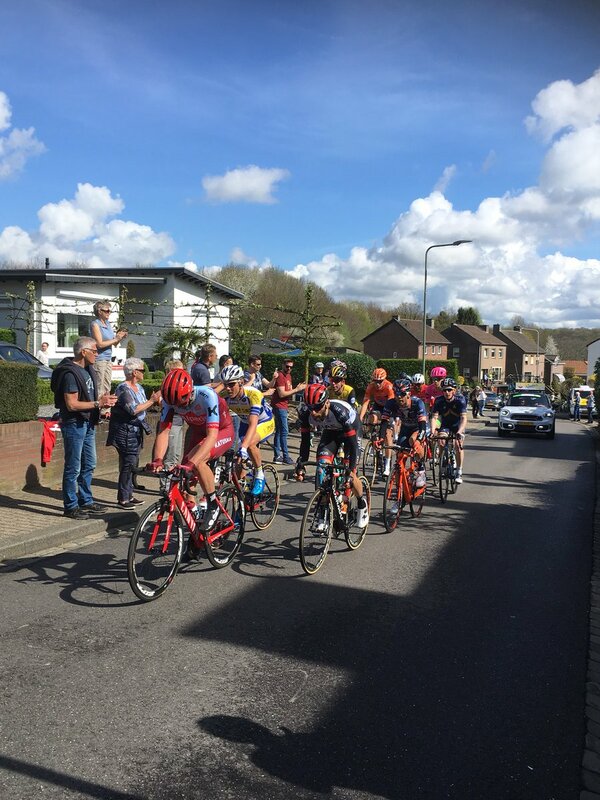 Women's race: Big split in the peloton and now eight riders are in the lead - Chantal Blaak (Boels-Dolmans), Amanda Spratt (Mitchelton-Scott), Lucinda Brand (Sunweb), Alexis Ryan (Canyon-SRAM), Lotta Lepisto (Cervelo-Bigla), Audrey Cordon-Ragot (Wiggle-High5), Giorgia Bronzini (Cylance), and Riejanne Markus (WaowDeals). 55km to go. More teams making their presence felt at the head of the peloton. Quick-Step, Lotto Soudal, BMC all have strong cards today - multiple strong cards, even - and their taking their share of responsibility. The gap to our nine leaders has come down to nearer the 14-minute mark. If you fancy a Amstel Gold retrospective, we've got you well covered. There are 79 photos in this gallery, along with a re-cap of everything that's happened since 2002. One name that stands out on that honours roll is that of Damiano Cunego. The Italian won the race exactly 10 years ago and is here again today, in what is the beginning of the end. 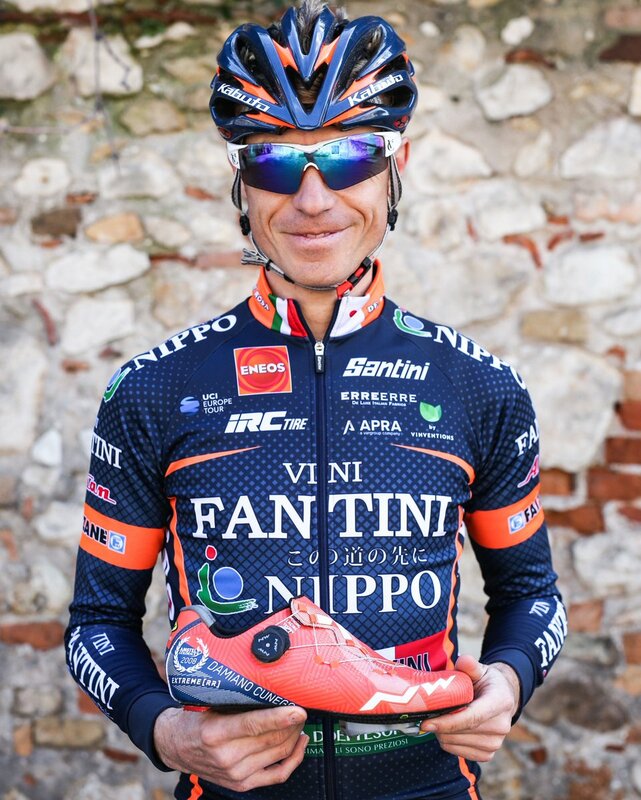 The 36-year-old had hoped to retire after the Giro d'Italia in May but his Nippo-Vini Fantini team weren't invited. Instead, this is his last major race, and he'll hang up the wheels for good after the Italian nationals in June. Here he is with a special pair of shoes for the occasion. It's all calm out there at the moment, as the Schweibergerweg and Camerig punctuate a relatively light phase of the race in terms of climbs. Wellens had a puncture but is back in. We've passed the 110km mark and the gap is holding at 14:30. Over in the women's race, it looks like the winner could come from that group of eight - they have a lead of 2:30 and most of the big teams are represented. They've just come over the Cauberg for the third-to-last time, with 35km to go. A second puncture of Gilbert. He'll be hoping to get the bad luck out of the way early as he looks to equal Jan Raas' record of five Amstel Gold titles. The peloton is eating into the breakaway's lead now, and it's down to 12:30. Onto the Cauberg again for the women and Blaak attacks. The peloton is led by Movistar and Ale Cipollini, the major parties to have missed out on this break. They're chasing hard and have brought it back to 1:40. Women's race: Blaak leads the way as the bell sounds for the final lap. Ryan and Spratt are with her, but it looks like Brand, Cordon-Ragot, and Bronzini will come back. Lepisto and Markus, meanwhile, are further behind. Random attacks being fired off in the peloton and they cross the line 1:38 down. Van der Breggen is sitting there, attentive. The gap in the men's race continues to fall under the impetus of Bora-Hansgrohe and Movistar. 11:30 the latest time-check at the half-way mark. Women's race: The six leaders (correction: it's Markus, not Bronzini) are not working well together here, and the peloton comes back to 1:10, with FDJ's Rozanne Slik off the front there. 12km to go but there doesn't appear to be enough urgency in the chase - Sunweb are massed on the front of the peloton but they have a rider up the road. 11km to go. With things all quiet for the moment in the men's race, we'll focus on the finale of the women's race. 9km to go. The six leaders hit the Bemeleberg. No attacks for now. Bronzini and Lepisto are still not out of this and are chasing together at 20 seconds. The peloton is back at 1:45 again so the winner will be coming from this group and it could be decided on the Cauberg. 6km to go. Cordon-Ragot is being bullied into doing most of the work here. She leads the way, calls for someone else to come through, and then finds everyone swinging over. Rinse and repeat. Blaak, Spratt and Ryan, remember, looked strongest on the last ascent of the Cauberg. Cordon-Ragot pulls off now and Blaak leads them into Valkenburg. Bronzini and Lepisto are at 10 seconds now but it's difficult to see them hanging in on the Cauberg after the effort of that chase. Here we go then: Cauberg time. 2.5km to go. Brand is the first to accelerate. Blaak is straight on the wheel and looking comfortable. Lepisto and Bronzini dropped almost as soon as they'd made it back on. Spratt goes now. Again, Blaak is straight on the wheel. Ragot is dropped and now Ryan and Markus are struggling too. Spratt accelerates over the top, Blaak and Brand go with her. Those three lead the way. Into the final kilometre. Blaak, Brand, and Spratt lead, with Ryan and Markus just behind. Spratt leads into the final few hundred metres. Blaak is poised. Brand third wheel. Top 10 and a brief report for the women's race can be found right here. Full report and photo gallery on the way shortly. Back to the men's race, then, and the pace has really increased in the peloton. The nine leaders have seen their advantage cut to nine minutes with 150km on the clock. Things being to heat up now as we head into the final 100 kilometres. Of the 35 climbs, we've had 21 of them. The second time up the Cauberg and Guelhemmerberg - and the first time with the Bemelerberg tacked on after - is not too far away. A reminder that you can see the remaining climbs over to the right of your screen. Bora still have a man on the front, followed by an Astana, and then a few Movistar jerseys. The gap to the nine leaders continues to fall - 8:10 now. Here's what Philippe Gilbert had to say to the television cameras at the start in Maastricht this morning. "They changed the finale but I think it's still kind of the same race. It's an advantage for the guys who want to attack, because it'll be hard to control for the other guys, with the small roads. We saw last year the course rewarded the guys who were aggressive and it might be even more so today." Gilbert, of course, won here 12 months ago. He's a four-time champion, no less, and none of the route alterations seem to have dented his ability to win here. Last year the race kicked off early and he went clear with Michal Kwiatkowski over the Bemelerberg - the final climb - before dispatching his fellow former world champ in the sprint. You can remind yourselves how that one played out with last year's report. The breakaway - Tankink, Dunbar, Craddock, Grmay, Tizza, Riesebeek, Van Hecke, Bono, and Smit - hit the Cauberg with a lead of 7:35. The nine men in the break come over the Cauberg together and across the finish line for the second time. They still have a sizeable lead for this stage of the race - 7:20 with 83km to go. The peloton hit the Cauberg now and some of the bigger names push their way towards the front. 2015 champion Kwiatkowski is right up there as Sky take over from Movistar. The peloton crosses the line with a deficit of 6:45. Movistar working hard to set up Valverde. Here is the Spaniard, sporting some questionable shades this morning. If you haven't seen our latest 'Holy Week' teaser, here it is. If you didn't know, we're getting into film, and our first effort is a documentary about the 2018 cobbled classics, with exclusive access to teams and the main protagonists. The nine leaders come over the Bemelerberg and their lead has ducked below six minutes. Grmay punctured at the foot of the climb and now faces an effort to get back on. Dunbar leads the way and the young Irish talent looks cool and composed. After the Bemeleberg there's a quiet stretch, with just a couple of climbs in the space of 20km. A key point could be the Kruisberg - around 40km out. That's where it all kicked off last year, and it begins an important string of climbs that will surely lay the foundations for the endgame. Quick-Step come back to the front of the peloton now as they continue to reel in the nine leaders. 4:30 is the gap with 61km remaining. Final call for our Amstel Gold Race preview, before it's too late. What can Lotto Soudal do today? They put on a fine display mid-week at Brabantse Pijl, with Tim Wellens taking a solo victory. Amstel Gold is obviously a different beast, with a much deeper field, but with confidence in the team, and two strong leaders in Wellens and Benoot (who won Strade Bianche last month), there's some anticipation over what they might do today. At the very least Wellens can always be relied upon for a speculative long-range attack. If I remember correctly, actually, it was Benoot's attack on the Kruisberg that ignited the race last year. The nine leaders hit the Loorberg, which is 1500 metres long at an average gradient of 5.3%. They do so with a lead of 3:40. Quick-Step are another team with multiple cards, in Gilbert, Alaphilippe, and even Terpstra. BMC, too, have Van Avermaet and Teuns. Bahrain (we haven't seen them at all at the head of the peloton) could have a say with Colbrelli, former winner Gasparotto, and Nibali, not to mention the Izaguirre brothers. Kwiatkowski would seem to be the one card for Team Sky but don't forget Sergio Henao was top 10 here last year. Poels is also there for Sky but is just returning from injury - and funnily enough as I write that we see him dropped from the peloton. 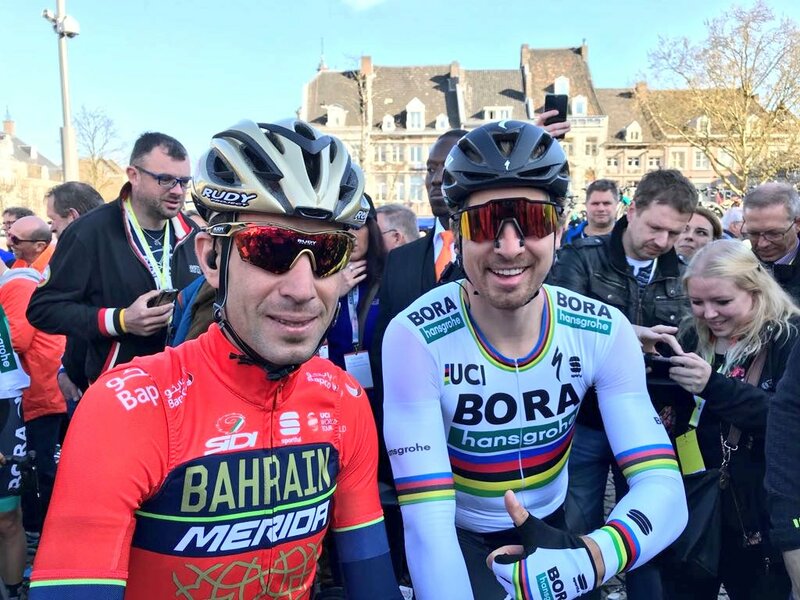 Even Bora have something of a plan B behind Sagan in the form of Jay McCarthy. The pace has been increased in the peloton and you can sense this is about to hot up. Are Bahrain reading this live blog? As that last comment goes live they suddenly appear en masse at the front of the peloton and are leading the way with a train on the left-hand side of the road, while Sky are over on the right. Up in the break Dunbar accelerates on the Gulpenerberg, putting some of his companions in difficulty. The peloton, led by Bahrain, crest the climb 2:30 in arrears. The breakaway has reformed following Dunbar's tester. Smit looked in trouble and is now sitting last wheel. It's single file in the peloton as we head towards the Kruisberg and a really crucial phase of the race. Crash for Rigoberto Urán. He's uninjured but not best pleased. That happened at a pinch-point at a tight left-hander and serves as a reminder of the importance of positioning in a race such as this. Onto the Kruisberg and Tosh van der Sande leads it for Lotto Soudal - he played an important role at Brabantse Pijl. Bob Jungels is up there in second wheel. Kwiatkowski, Van Avermaet, Sagan all up there near the front. It's not kicking off on the Kruisberg like it did last year but the race is very much on now. Next up is the Eyserbosweg, and it's comes almost immediately after the Kruisberg. It's a steep little on, and once again we see Dunbar leading the break up it. Back in the peloton, 1:50 in arrears, it's Jungels who takes over. No attacks just yet but the increase in pace is putting many riders at the back of the bunch in real difficulty. Gorka Izaguirre accelerates now. Kreuziger on the wheel and takes over now. There are splits in the bunch over the top of the Eyserbosweg. No real groups forming from those splits but the thinned-out peloton is strung out now as they catch Tizza from the break. The climbs are coming thick and fast and now it's time for the Fromberg (1600m at 3.6%). Just seven left out front now. Rudy Molard puts in a small acceleration but it's short-lived as Mikel Landa hits the front and raises the pace. There's a group of around 30 riders chasing this main peloton of favourites. Colbrelli is in there but it doesn't seem that any other big names have missed out. Another Izaguirre attack and this time it's Jon. And this time it's a real attack with a real gap. The Spaniard was seventh here last year. Izaguirre is away here. He's on narrow country lanes and pulling out a decent gap. Sagan takes a crafty little short cut behind some spectators. Interesting to see what happens there given Luke Rowe was unceremoniously pulled out of Flanders for something similar two weeks ago. Izaguirre is climbing the Keutenberg but he's about to be caught now. Sagan with another seated acceleration like the one we saw at Paris-Roubaix last week. It doesn't last long, as he eases up and looks around, but the world champion is testing the legs of his rivals. Fuglsang tries his hand now. Valverde closes it down. The faovurites are being drawn out now. Kreuziger is the next rider to open a gap. Sagan is on the front but not riding too hard, and Gasparotto now strikes out in pursuit. Meanwhile the remnants of the breakaway forge on with a lead of 45 seconds. Just three climbs to go now, and they represent the finale. It's the Cauberg, then the Geulhemmerberg, and finally the Bemelerberg. We'll be on the Cauberg in just over 5 kilometres' time. Gasparotto links up with Kreuziger and they have almost 20 seconds over the 'peloton', which now contains around 30 riders. Kreuizger and Gasparotto may not be in the top tier of favourites for today but they've both won this race before - Kreuziger in 2013 and Gasparotto in 2016. Pieter Serry is now leading the chase for Quick-Step. Gasparotto and Kreuziger have 25 seconds over the group of favourites. Meanwhile there are still six left in the break - Dunbar, Craddock, Grmay, Van Hecke, Rieseebeek and Bono. Mechanical for Matthews. It takes a while to get a wheel to him and it takes a while to change that wheel. He's passed by the second peloton. We're on the gentle downhill approach to the Cauberg. The six leaders have 15 seconds over Gasparotto and Dunbar, while the main group of faovurites is a further 25 seconds back. Craddock leads the race onto the iconic climb. Who's going to use this as a launchpad? Here comes our first attack, and it's Bert Jan Lindeman from LottoNL. He quickly opens a gap. Kreuziger and Gasparotto catch the break on the Cauberg. Now the responses come. It's Henao leading the pursuit of Lindeman. Dunnbar is dropped but the rest of the breakaway riders are on the wheels of Gasparotto and Kreuziger. The group of favourites has thinned massively after the Cauberg. Van Avermaet attacks now! Rudy Molard follows the Olympic champion. The leaders cross the finish line for the penultimate time. Molard and Van Avermaet follow at 16 seconds, the rest of the favourites a handful of seconds after that. Rui Costa, Bauke Mollema and Mikal Landa have all been distanced from that main group. Gasparotto and Kreuziger continue to drive on, with the breakaway remnants tagging along for the ride. Van Avermaet and Molard have a handy gap now. They're about to take on the Geulhemmerberg for the last time, and this is the penultimate climb of the day. Gasparotto leads them onto it and they still have 15 seconds. Henao leads the pursuit of Van Avermaet and Molard, and the duo is brought to heel. This group of favourites has thinned out and there's a small split as they hit the climb. Valverde picks it up now. Wellens responds. Sagan third wheel. Alaphilippe and Valgren there too then there's a gap to the rest. Valverde accelerates again and they catch the lead group. Wellens is back in, Fuglsang gets back now too. Daryl Impey attacks from that second group now. Sagan takes a turn on the front. It's him, Valverde, Gasparotto, Kreuziger, Wellens, Valgren, Fuglsang, Alaphilippe, and then the breakaway remnants - Van Hecke, Riesebeek, Craddock, Bono. Impey is caught in no man's land as the leaders hit the final 10km with a lead of 20 seconds over the rest of the main favourites. Riesebeek attacks now, having been out in the break all day. What a day for him showing the colours of Roompot on home soil in a week when they extended their sponsorship of the Pro Conti team. Teuns leads the second group of favourites, Kwiatkowski on the wheel, Jon Izaguirre behind him. Fuglsang and Bono join Riesebeek. Astana have to play this card, with two riders in this front group. 10 seconds is the gap between the two groups of favourites. The Fuglsang move comes to nothing and the front group of 12 comes back together. Riesebeek goes again! Van Hecke, another breakaway member, goes with him. Fuglsang has to follow again. Time for the Bemelerberg, the final climb of the day! Fuglsang catches the dup and passes them. This is his main roll of the dice. Valverde reacts now and he's closing in on the Dane rapidly. Valverde catches Fuglsang. There's a gap back to Alaphilippe's who's grimacing as he tries to regain contact with Valverde's wheel. He does so. Sagan is sitting in there behind Alaphilippe. Fuglsang is on the front of this group, Valgren right at the back. Riesebeek and Craddock dropped as Gilbert leads the second group of favourites, but they're 17 seconds down again. Sagan comes to the front now but they're starting to look at each other, wondering who's going to strike out next. Wellens, arms folded over his bars, sets about dragging him back. Sagan takes over now, and Valgren is brought back, one match burned. Sagan, Kreuziger, Valverde, Fuglsang, Valgren, Gasparotto, Alaphilippe, Wellens. That's the composition of this lead group. 25 seconds is the gap now. The winner will come from this group of eight. Astana have the numerical advantage, but can they make that count? They've already burned some of their matches. Sagan has to be the favourite in a sprint. Valverde hits the front and looks on a couple of occasions like he might be on the verge of an attack, but nothing yet. Valgren tries for a second time. He has a very small gap and it's Kreuziger who goes in pursuit, and there's a gap now back to the rest. Who's going to shut this down? Sagan isn't... and suddenly there's real danger. Gasparotto caves in and goes after them. And again, he's off on his own. Valgren and Kreuziger are into the final km with a real chance here! Gasparotto is coming across. It's game over for Sagan, Valverde et al. Kreuziger comes through to the front as Gasparotto just fails to make the wheel. What a win for the Dane, and what a season - he won Omloop Het Nieuwsblad in February, remember. Astana had the numbers and made them count, with arguably the strongest riders - Sagan, Valverde, Alaphilippe - effectively marking each other out of the race. Here is our report page, where you can find a full write-up, full results, and a photo gallery.